The first deed on record, filed in the Clerk's office in Orange County, some 231 years ago., is dated March 5th, 1703. This deed, given under Royal authority in the reign of Queen Anne, was signed by twelve Indian Sachems, or Chiefs, then living in different parts of our historic Orange County. The signatures of the Indians were each made with a different sign or mark. The twelve New York inhabitants who received this patent of more than 450,000 acres, were land speculators, who had Golden Dreams of fortune from the sale of this large body of land. In our immediate section, the original owner of land under this grant, was one Philip Rockeby, who sold his undivided tract a year later to Daniel Cromline, by deed dated June 10th, 1704. Land patents at this early date were issued without any regard to actual survey and were very indefinite in their boundaries. It was not until many years later; that this Cromline patent was surveyed, on June 6th, 1741, by Richard Edsall, C. E., then living in Goshen, who found that Cromline owned no less than 3628 acres of upland and 411 acres of meadow. In this survey Edsall mentioned ownership of two farms along the Cromline, then called the River; one William Seely, and the other Rulof Swartwout. About four years later I find record of a deed from John and Katherine VanHorn, who in 1708 bought one twelfth of this Cromline tract and later said one hundred acres to Rulof Swartwaut for 45 pounds, or about $225.00, deed dated Oct. 30, 1734. During these years, one Samuel Clowes bought a tract of this land from Cromline. I find a sale by Samuel Clowes to Henry Young in the East Division of Goshen for 304 acres for 98 pounds, or about $490.00, under date of April 2nd, 1733. The title of this property still remaining in the Young family a period of two hundred years. Some years later John Yelverton, who came from Chester, England, before 1700, held title to property in Cornwall, Grand Street in Newburgh and at Goshen. At that period a large number of persons interested in this patent, made a deed in trust to John Yelverton for three tracts of land covering 70 acres in the Village of Goshen for the Presbyterian Church, minister's house, burying place and settling a minister. The deed for the trust was July 10th, 1721. Later he located in Chester and built his home. 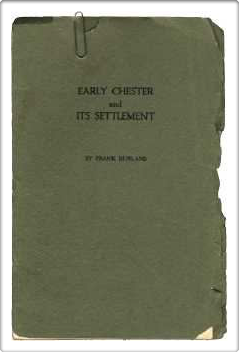 Chester at that time was a small hamlet in the town of Goshen. We have the deeds for the following sales: a tract of 120 acres was sold to one John Beers, who in turn sold a portion of 42 3/4 acres to one John Ensign, dated June 16th, 1751, who then sold this same tract by deed dated May 19th, 1755, to John Yelverton for the sum of 97 pounds and 4 shillings, about $475.00. This is part of the acreage on which our village of Chester is located. During the years 1755 to 1765 John Yetverton erected the home bearing his name. The probate of his will occurred in 1767 giving this property to his grandson Abijah, our record of this authentic date, the Will naming the grandson Abijah the "Inn-keeper". In these early days, the Innkeeper was a very important personage, as we find Abijah, giving in 1783, an acre of ground on which the First Presbyterian Church was erected in rear of Washington Hotel prior to 1798. Also, he was the sole Librarian for our first public Library, Incorporated November 17, 1797, with 100 volumes with the annual dues of $5.00 per year. Referring to this Yelverton Inn, I have from Mr. George S. Banker, born 1818, (to whom I am greatly indebted for a great amount of this early information). 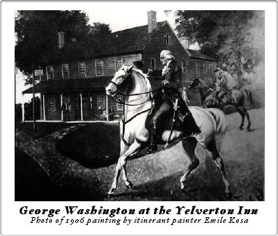 Mr. Banker recalled the swinging sign "Yelverton Inn, Kept by A. Yelverton". This Inn continued until Mr. Abijah Yelverton's death in 1832. I have a photostatic copy of the map signed and dated 1777, made by General Erskine, F. R. S., Geographer for General Washington, which mentions "Yelverton Inn", Chester, on King's Highway, Blooming Grove on to Newburgh. Some years later as the number of inhabitants increased we find 1785 a Saw Mill and Grist Mill using the water power of the Otterkill at West Chester. Thus the settlement grew at this point, a country store was being operated on the corner and a Hotel opposite, a blacksmith shop stood just below the Corner on the Goshen road. Our first Post Office, 1794, stood in a small building in the lot across from C. E. Johnson's present home. Joseph Wickham was Postmaster. A tannery was located in the same lot. The mails were brought from the north through Goshen to Chester over the road that was afterward surveyed in 1803. The mail coaches exchanged mails at the intersection of these roads, at the present time known as Durland's Square, with the coach from Jersey and New York, running through to Newburgh. Our second Post Office occupied part of the old Dunning house in the old Village. Upon the advent of the Erie railroad, the Post Office was again moved to a building standing on the plot of ground now occupied by the Standard Oil Co. This building was erected by Benjamin Moore and operated by him as a hotel, later as the Post Office and later on as a shoe factory. Our older citizens recall it as the Bacon Building that was later destroyed by fire. During the years from 1721 to 1846 (a period of 125 years) we were a small hamlet in the Goshen Township. Before the year 1846 a political condition having arisen in the Board of Supervisors which they were in need of another Democratic vote in that political body, to satisfy the political ambition of a certain person, who was anxious to become Supervisor. 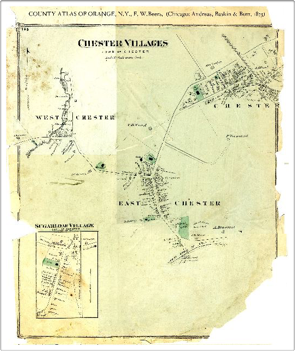 In order to carry out this well laid plan, a small area was taken from the four present surrounding townships, and the small town of Chester of over 20,000 acres was erected. The first town meeting followed. History tells us the Democratic Elector was defeated and Mr. James Gray, a Whig, was, elected the first Supervisor to represent our town of Chester in the County Board. It will be interesting to learn that the idea of offering milk to the consumer in the City originated with a road contractor by the name of Selleck, living in Chester, who interested some of our leading farmers in this project and succeeded in getting a supply sent by the Erie in 1842. The fluid milk was shipped in blue pyramid churns of that day. The first shipment was about 240 quarts, or six cans, freight charges were 20¢ per cwt., The price paid the producer was 2¢ per quart on the cars at Chester, the farmers finding that milk at 2c per quart was better than butter at 15c per pound. Thus the milk business was born in Chester. In spite of the many difficulties, this business has been the means of building four railroads in historic Orange County and returned over one hundred million dollars to the farmers. Some years later we find John Yelverton, born in Chester,England in 1693, arriving in this country early in 1700. He died in New Windsor and was buried in the old Presbyterian burial ground on the shore of the Hudson on July 17, 1767. The remains and brown slate headstone are now resting in our own Chester Cemetery-"held title to property etc". As early as the year 1716, we find the first settlement was made in our community by Daniel Cromline, located on the present King's Highway, midway between Chester and Craigville. Cromline owned in the year 1704 nearly 4000 acres of land. On this tract he built his home, which later he called Greycourt. This Inn was located opposite the present home of Wm. R. Conklin, Jr. This house remained until the year 1832 when it was torn down. During these years it was a favorite stopping place on the King's Highway. The corner stone that marked the date of this building which was marked D. C. 1716 G. C., now rests in the foundation of the Wm. Bull descendants home in Hamptonburgh. It was during this year that the emigrant, Wm. Bull, who was born in Wolverhampton, England, in February 1689, came to America. He immediately entered the employ of Cromline who needed the service of a stonemason. Bull assisted in the building of this historic home. During these' years we find Christopher Denn, who was one of the twelve original Patentees of the Waywayanda Patent, owned a large body of land in the Hamptonburgh region. Being desirous of opening up this area for an early settlement, Denn offered 100 acres of land to the pioneer white woman to settle and live. This person proved to be Sarah Wells, who had married Wm. Bull in 1718. Then followed the building of the historic stone house, which was their future home. From this union sprang the present Bull family in America. Sometime thereafter, we find Nathaniel Roe living in Florida (another of our early settled hamlets), who purchased on Dec. 4th, 1751, 980 acres from James Ranaundet and Christopher Banker, merchants living in New York City, Executors of Petrius Rutgers, who was also one of the twelve original patentees. This acreage was a part of the original patent of 3000 acres. The balance, about two-thirds, was later sold to Cornelius Ellison for two hundred pounds, or $1000.00. Nathaniel Roe Sr., gave this land to his son, Nathaniel Roe, Jr. by deed dated March 6th, 1759. Nathaniel Roe, Junior honorably served in the war of the Revolution as a Captain of the Militia. The property today is owned by the family, down to the sixth generation of the present ownership, of the late Alfred Roe, located on the Valley road. During these years Peter Townsend built his home directly opposite the present Presbyterian Church. Isaac, his brother, lived in a story-and-a-half house on the present Brook Farm. Another brother occupied a home on the present site of Mr. C. S. Hunter's home, afterward owned by John Springstead, then Elmer Cooper to Doctor Dodd. About the year 1800, it was sold to a member of the Board family. During the time that Peter Townsend lived in our village, together with Wm. Nobel, owned and operated Sterling Mine, and furnace steel was made there as early as 1751. After the British captured Forts Clinton and Montgomery, the Government, still of the opinion that the Hudson River could be obstructed by an iron chain, sent Secretary of War, Mr. Pickering, to the home of Mr. Townsend in Chester, where a contract was signed on February 2nd, 1778, for the making of the final chain, which later on was successfully passed over the River from Constitution Island to the main shore. The British were never successful in passing this point again during the war. In the year 1730, Lord Sterling, requiring the services of a practical miner, sent Cornelius Board and his family from Sussex County, England, to America, with the purpose of discovering copper ore. While Board was prospecting up and down the Ramapo Valley, he discovered, not copper, but the rich deposit of 65% shot ore at the outlet of the now known Sterling Lake. He immediately built a forge and bloomery and began producing iron as early as the year 1738, which place he called Sterling in honor of his patron Saint. Cornelius and his wife, Elizabeth, brought with him from England two sons, James 1st, born 1720, and David, born 1727. The third son, Joseph, was born in America, 1736. James 2nd was a private in the Bergen County Militia, David was a Major, and Joseph a Captain and each saw honorable service in the Continental Army in the war of the American Revolution in the years 1776-1783. The above pioneer Boards were the founders of this family in America. Another soldier who saw service at this time was David Grossett Drake, born in 1760, whose home is standing today as the old house below the present home of our Village Clerk, James S. Demerest. Mr. Drake is now buried in our present cemetery. The Samuel Satterly home, now entirely disappeared, was on the brow of the hill toward the present Greycourt Station. The well known Banker farm, near Otterkill, originally the Webb place, was sold to Issac Banker before 1800. This was the birthplace of Mr. G. S. Banker. In 1742 Elihu Marvin, afterward in the year 1778 Judge of the Court of Common Pleas, lived on the late Oscar Durland farm. As early as May 8th, 1732, Daniel Denton purchased land of John Everett, now the present farm of Mr. T. F. Lawrence. In the beginning of this settlement, it was quite as necessary to arrange for a burial plot as at the present day. I have the following information covering the half acre located on the farm of Mr. Albert C. Bull: "Michael Jackson, who died in 1789 is said to have bought this land in 1731 from the Indians. The farm was again sold in 1812, to Sheriff Benjamin Jackson, at this period setting apart and deeding to the family and a few neighbors this ground and a right of way to same." 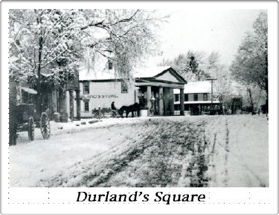 Charles Durland, who was born at Oyster Bay, Long Island, March 19th, 1731, and died here on December 17th, 1798, came to Chester in the year 1754 and later bought the farm across the Otterkill at West Chester. In the year 1755 he married Jane Swartwout, of the family of Rulof, who in the year 1734 owned a farm along the Cromline. The Durland family were Dutch Reformed adherents and landed on Long Island in 1652 from the Zeider Zee in Holland. From this union of Charles and Jane there grew up a family of nine. children, who swelled the census with no less than fifty-seven grandchildren. These are the founders of the present large Durland family in Orange County, now living to the seventh generation in our village. A son, Samuel, occupied the present H. B. Green farm; Thadeus Seely, Sr., on the late James Seely farm; Mayor James Holbert on the present Harry L. Green home. 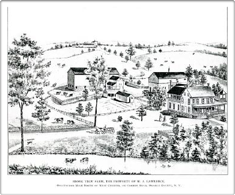 On the Newburgh road, Samuel Denton lived on the former Jenkins' place; Herman Fink and Isaac Gillette on the present E. D. Chamberlain farm; Hezekiah Moffatt on the Vacation Girl's Home. The present R. E. Young home was the farm in early years belonging to Asa Vail, who sold to Dr. Townsend Seely, then to Edmund Seely to Seth Satterly. The present street from the corporation building to the Erie Station was not opened until the Erie trains were running in the year 1842. The brick used in the buildings in the lower village were hauled over High Street, from the brick yards located below the present lumber plant of Mr. Walter J. Conklin, our present Village President, at East Chester. Long before the opening of the Erie, the lone building standing below the Townsend place was a small home of the Jackson family, foundation of which was uncovered when the present Episcopal Church was erected and dedicated in 1898, when our present Rev. J. Holmes McGuinness, D. D., was elected at that time. The Second Presbyterian Church was built in 1829 in the center of the present cemetery. The present large church was built in 1853 and dedicated January 4th, 1854, under the pastorate of the Rev. J. W. Wood, D. D. One of Mr. Wood's honored friends was Mr. Thomas Powell of Newburgh, who presented to the Congregation the large sweet toned bell with the suggestion that "he would present a bell large enough to awaken the sleeping Christians." The Methodist Church was organized in 1837 and for a time used the large room in the Yelverton Inn. The present beautiful home of Mr. Frank O. Roe on High St. was the original Presbyterian parsonage. During the early years a small farm containing several acres of land, belonged with the residence, the land running through High and Main Streets, and below, taking in a few acres of the Black Meadow. Today on this property is located a number of attractive homes. The onion industry had it's beginning in the year 1861. Before that time, this 500 acres of rich alluvial deposit was idle, excepting the few acres that were used in raising flax. The Civil War created an urgent demand for onions. Thus began an industry which for many years was very successful. Our annual production averaged over 60,000 bushels yearly. We have an interesting Revolutionary local history. The inhabitants living in and about Chester were indeed true patriots. A representative of all were signers of the Pledge in Goshen, Orange County, on June 8th, 1775, and added great assistance to our Army during this long war. During these years, our Chester Company, organized in 1775, was attached to Col. Allison's Goshen Regiment. We find record of service of this Company from 1776 until April 1779 taking part in both engagements at Forts Clinton and Montgomery, and the Battle of Minisink on July 22nd, 1779. During these years our Company was called to arms no less than twelve different times, and spent a total of 292 days in the field. In fixing the exact date of the encampment of the troops on the farm and hill, where our present High School stands, I find recorded in the Public Papers of General George Clinton, Vol. 1, page 454, the following order, issued by John McKesson, Secretary: "In the Committee of Safety for the State of New York, Fishkill, Dec. 9th, 1776, it was resolved: "that all the Militia of Orange and Ulster Counties be ordered to march, properly armed and accoutered, with four days provisions, to Chester in Orange County, New York, there to receive further orders from General George Clinton for effectually cooperating with Major General Lee and Major General Gates in harassing and distressing the enemy, who have entered the State of New Jersey. The said Militia shall be allowed Continental pay and rations and one penny a mile in lieu of rations until they come to place of rendezvous". This was followed by another order a little later ordering part of the four regiments to march from thence to New Jersey, leaving about three hundred men in camp on the High School hill for the balance of the winter, 1776-1777. On Oct. 7th, 1777; Capt. Wood, of our Chester Company, was sent to guard the Ramapo pass at Suffern. I will tell it in his own words in his report. He was ordered by Majar Thomas Moffatt, with twenty men, to follow the enemy. "At about two o'clock in the morning I fell into a party of the villains to the number of ten. (After challenging they refused to stand). I fired, killed one dead on the spot, and wounded another, who died next morning. At the time I challenged I had but six men, I had sent the others out to surround two suspected houses. The one dead had in his purse 7 half "Joes", 1 whole "Joe", 6 Guineas, 4 Spanish dollars, a pair of large silver buckles for both knee and shoes. The whole is worth between 50 and 60 pounds, which I divided among my men." The man killed was Michael B., from a pass in his pocket. He was out enlisting men, as he was heard the previous night, drinking to the health of King George and the damnation of Congress. During these trying years no one person was more useful to the cause of freedom than our patriot, Henry ,Wisner, who lies buried in the Phillipsburg Cemetery. As early as Sept. 17th, 1774, a meeting of all the electors of Orange County was called to assemble at "Yelverton Inn" in Chester, Orange County, New York, resulting in sending Henry Wisner to the Provincial Congress to be held in Philadelphia on Sept. 5th, 1774, to protest against unjust taxation. He was so busily engaged with Powder making at the above place that he was unable to reach Philadelphia in June, 1776, to be present at the signing of the Declaration of Independence. Our earliest district school of importance was built on a 40 x 40 lot, where at present is located the home of Joseph Verbert. The building was erected late in the year of 1700; This school continued until 1842-1843. My father, the late Joseph Durland, born in 1832, was a pupil of Samuel Gillett at this time. He informed me that on the arrival of the first train over the Erie at Chester, school was dismissed and all were given a holiday. The children gathered on the Hill awaiting the arrival of the train. He also said that both banks of the Railroad at that point seemed to be covered with worn out and discarded short handled shovels. In our day of the steam shovel, think of digging a railroad through a fifty foot embankment by hand labor. Our Chester Academy was next built an a lot directly across from the home of R. E. Young on the Goshen road, the land formerly owned by Aaron Cox, afterward said to Charles H. Durland in 1791 and later on was donated by his heirs to Chester Academy, to be used for school purposes only. The building fund was raised by subscription, managed by a Board of Trustees, supported by the payment of tuition by it's scholars. The contract was awarded to Mr. G. S. Banker for $2800, building began in the spring of 1842 and was completed in October of that year. At the formal opening a play was given in the then called "exhibition" hall, a room 40x44 feet. Ex-Governor Will. Bross, later of Illinois, was the principal. For a long period of years it gathered its scholars from for and near and was successful. The Academy continued until the year Nov. 12, 1869, when it became Chester Union Free School, District No.1. In 1843 a district school was built along the Otterkill at West Chester. This school had a small public Library, with Ebenezer Foster as Librarian, and Sarah Berry as teacher. The second district school, the brick building on High Street, was built in 1857; the brick school at East Chester was built in 1858. Before this time a small district school house was standing a little below "Derrydale" Farm on the Goshen road. The amusements of our early days, when our population was not over two hundred, were made by the home people, which were quite different from our paid entertainments of today. These were the days of fine running horse so Mr. Banker tells me during the years 1830-1840 the principal races were run from the corner at East Chester to the foot of the hill, Nanowit Park, on Route 17. On special days this course would be lined with people, from miles around, on either side; bets were laid and races run. When the races were finished the crowd retired to Hazard's Hotel, standing on the lot where the home of our Village President now stands. During these years we had Weber's Kentucky Whip, Saltrum, and other well known sires. I have heard it said it was much easier to find the place where a barrel of rum was made than to locate the mill where the first flour was made for bread making. However, our first grist mill before 1785 was located on the Otterkill about where the present saw mill stands; another mill on the Valley road at Bull's Mills, run by Richard Bull long before 1800. History always mentions Madam Brett's Mill at Fishkill as the very earliest for grinding wheat. We have many other very early families among our settlers. You will recall that one Wm. Seely owned a farm along the Cromline before 1741, no doubt the founder of our large Seely family, which should be traced and published. The Knapp family of Sugar Loaf, also the Stevens, are among the pioneers of our section. All the maps I find made before or at the time of the Revolution mentions Sugar Loaf. I find an account of the Jersey troops on their way to join the Sullivan Expedition camping over night at a small village called Sugar Loaf, next day passing through a fertile section called Chester. It has been difficult to select from the large fund of early information, which I have gathered together for the past years. If you have enjoyed this disconnected history, my task will have been to me a pleasant one. Used as a Tavern for 67 years and occupied by six generations of the Yelverton family. 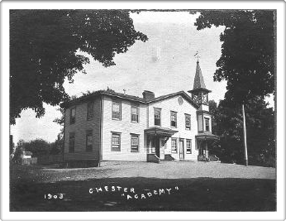 Chester Academy was founded in 1845. The old book records were probably destroyed in one of the fires which have occurred in Chester, and we cannot give the names of the founders nor of the first board of Trustees. A building was erected immediately. It is the one now occupied by the Academic Department of the Union School. The school had quite a flourishing existence for some years, under the care of the regents of the university, and sharing in the distribution of the Literature Fund. William Bross and Stephen Bross were the first teachers, the former of whom later became Lieutenant-Governor of Illinois. Rev. Phineas Robinson was the principal from 1849 to 1857. He was succeeded for one year by H. Osborn. Edward Orton taught here from 1859 to 1865, and he is now a professor in the Ohio State University at Columbus. A. Phinney was in charge from 1865 to 1868 and J. H. Cunningham taught for a time just before the academy became a Union School (1868-1869). Camilla S. Thompson, who was born 1849, says "the first teacher I remember in charge was Phineas Robinson. My first individual teacher was Theodore F. in the old academy, in the Verbert house, opposite the Edmonston property". The successor of the Academy, was organized in the fall of 1869. It was a consolidation of three former districts including a portion of the Town of Goshen. 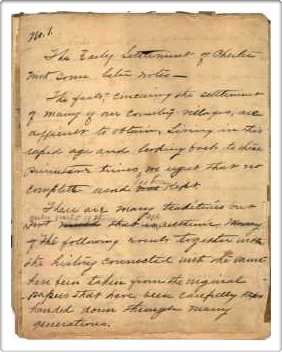 The first meeting was held, pursuant to legal notice, Nov. 6th, 1869. At this meeting Robert W. Colfax was chairman and Lewis Masterson, Secretary. The next meeting held November 12th, the enterprise was accomplished and the first Board of Education chosen, viz: David R. Feagles, John B. Tuthill, Joseph Durland, Cornelius B. Wood, Charles P. Smith. The first president of the Board was David R. Feagles; Joseph Durland was Clerk and William B. King, Treasurer. The latter had already served several years as treasurer of the Academy, and he has been retained to the present time, making some twenty years service as the custodian of the school moneys. The present board (October, 1880) consists of C. P. Smith, Alfred B. Roe, D. Howell Roe, Hiram Tuthill, and J. Hudson Board. The president is C. P. Smith and the clerk, Hiram Tuthill. The succession of principals has been H. P.Robinson, F. R. Ferris, N. H. Hart, William Simpson, for many years, and J. S. Eaton, the latter closing with the spring term of 1880. The Academic Department is in the Old Academy at Chester Village, the present teachers at the place are B. C. Nevins, Miss R. M. Everts, Miss A. M. Gaunt, and Miss M. B. Seeley. A primary department is maintained in the old school house at the Depot Village. This is now taught by Miss C. S. Thompson. This Union District includes the entire group of villages – Chester, West Chester, East Chester, Chester at the Erie Depot, and Greycourt Station. We believe that Frank Durland began writing this 30 page hand written manuscript in the late 1890's. Later published in 1930's as a 14 page booklet.